The Klymit Inertia XL accommodates more body shapes and sizes with its more neutral body map design. The Inertia XL offers the same technologies as the Inertia X Frame, such as loft pocket technology, customizable pressurized comfort and support, ultralight and compact, and low volume for inflation. This is the ultimate pad for those looking for a little more comfort and support but still want the smallest, lightest thing out there. 1. Why body mapping? Body mapping allows Klymit to make the lightest, most compact, and incredibly comfortable sleeping pads. The pads are designed around the human anatomy to support you where you need. 2. Why are there cut outs? The cut outs are called loft pockets. They increase warmth while decreasing weight by allowing your sleeping bag to loft into the pockets. They also allow for a breathable pad on a hot summer night. 3. What are loft pockets and how do they work? Loft pockets are the cut out portions of Klymit camping pads. They allow you to capture the warmth of your sleeping bag underneath you. Rather than having a big, heavy, bulky camping pad for warmth, Klymit pads give you more warmth at a miniscule weight. 4. What is the R Value? 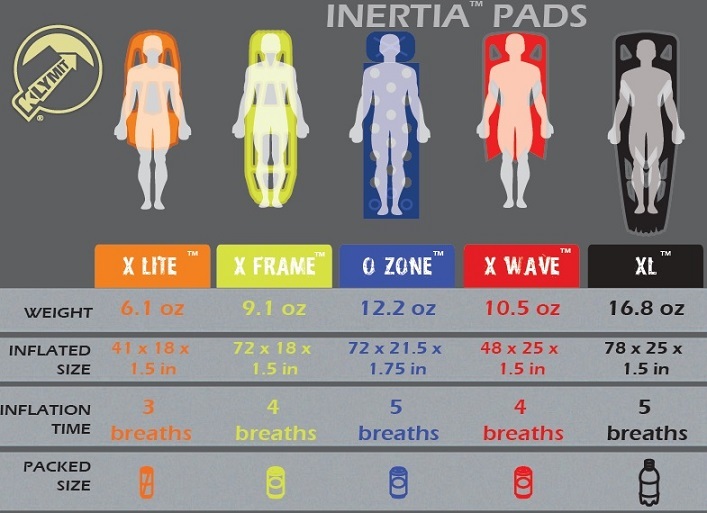 Klymit Inertia pads do not have an R Value because they use the warmth from your sleeping bag. If you have a sleeping bag that is rated to 0 degrees, then you can use any of our Inertia camping pads at that temperature. 5. Is there a warranty? Klymit offers a limited lifetime warranty on all pads. 6. Can you use it inside the bag? Yes, many of our customers love this option because they stay perfectly oriented on the pad all night long. 7. Do you have to use it inside your bag? No, many users prefer it underneath. 8. What is the Dry Air Pump for? The dry air pump is for those who prefer a firmer sleeping surface. You can pressurize some Klymit pads to your comfort preference. 9. Can I side sleep on the pads? Absolutely. During development we made sure that even the most avid side sleeper slept comfortably supported off the ground. 10. Are the pads comfortable? Absolutely! The pad\xCDs comfort will depend greatly on you and how you customize the pressure of it. Try the pad at a low pressure and then increase it from there with the dry air pump to find a pressure that is right for you. Some like it soft, some like it hard; you choose your comfort.